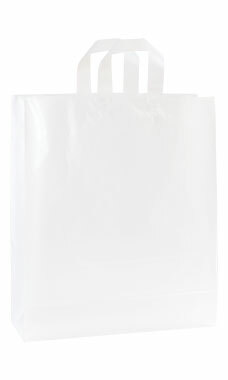 These frosted, clear plastic shopping bags are a popular choice among retailers. Perfect for retail purchases and gifts, these frosted plastic bags offer sophistication at an affordable price. Each frosty is made of high-density plastic for durability and features loop handles with a cardboard bottom insert to keep it standing for easy bagging at checkout. Great for special sales, holidays, or every day use, your customers will love taking home their purchases in these medium clear frosty shopping bags. Sold in a case of 25.